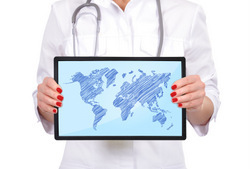 Northwestern University School of Continuing Studies, in partnership with Northwestern University Feinberg School of Medicine’s Center for Global Health, is offering a new online Master of Science in Global Health program starting fall of 2014. The degree program offers tools needed to become leaders in global healthcare and address some of the most important, far-reaching and urgent health issues of the 21st century. Nearly 40 infectious diseases (such as AIDS and West Nile) have emerged since 1973. Diseases that were once suppressed, such as malaria and tuberculosis, are again on the rise and many lives are lost in vulnerable, underserved populations due to largely treatable illnesses. Faster and more fluid movement of people means serious health threats often cross national borders. Billion-dollar investments by government agencies and major foundations to combat the problem, dynamic changes in the global economy and continued strong growth in the healthcare industry are driving demand for exported healthcare technology and expertise. Northwestern’s new degree program — the only one of its kind available online — was carefully designed to help clinicians, researchers, epidemiologists, nonprofit administrators, policy analysts, social entrepreneurs and others make a meaningful difference in healthcare access and outcomes in the places where it’s needed most. Through multidisciplinary courses that emphasize theory and practical skills, students will learn how to improve healthcare outcomes and systems, work effectively in challenging healthcare settings, navigate global regulatory issues and evaluate results. “Graduates of the MS in Global Health program will be prepared to identify needs, navigate complex political, sociological and regulatory environments and deliver impactful healthcare solutions,” said Robert Murphy, MD, director of the Center for Global Health and the John Philip Phair Professor of Infectious Diseases at Feinberg. Students will also benefit from access to a top-ranked academic medical center and dedicated center of expertise through the program’s partnership with Feinberg’s Center for Global Health. The master’s program draws faculty from the University’s renowned clinicians and researchers who address global health issues through innovative teaching, pioneering research and advanced clinical care. The program consists of 12 online courses, each 10 weeks in length.